New volunteers at our second annual Volunteer Orientation. 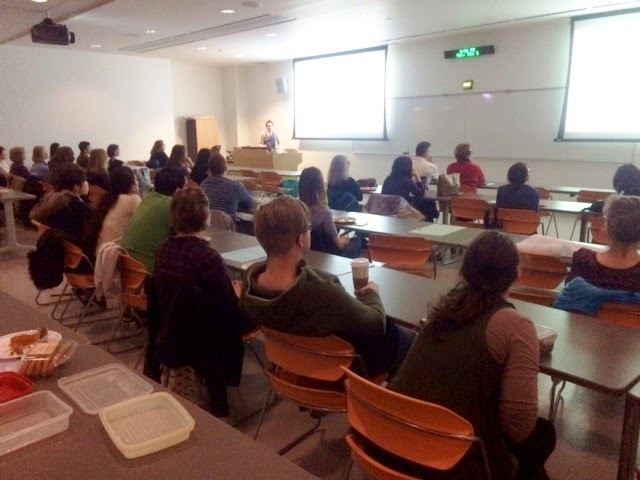 We had an incredible season kickoff this past Saturday with over 60 people showing up for our Volunteer Orientation!! 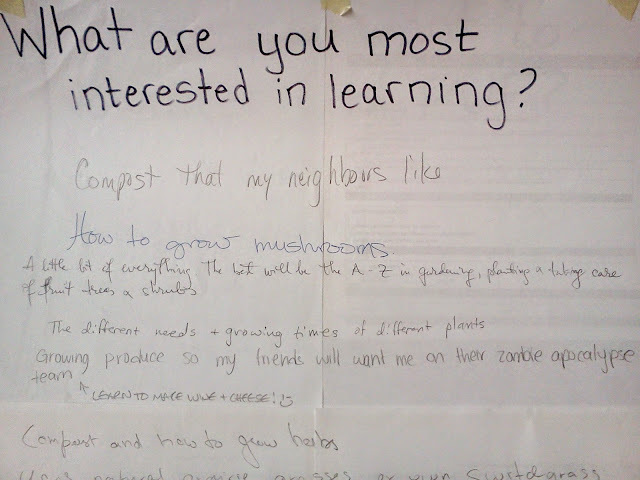 We broke up into groups and talked about what brought us to Prairie Urban Farm and what we were most excited to learn about. The groups spent some time brainstorming ideas related to artscaping, community engagement, education, and sustainable urban agriculture! 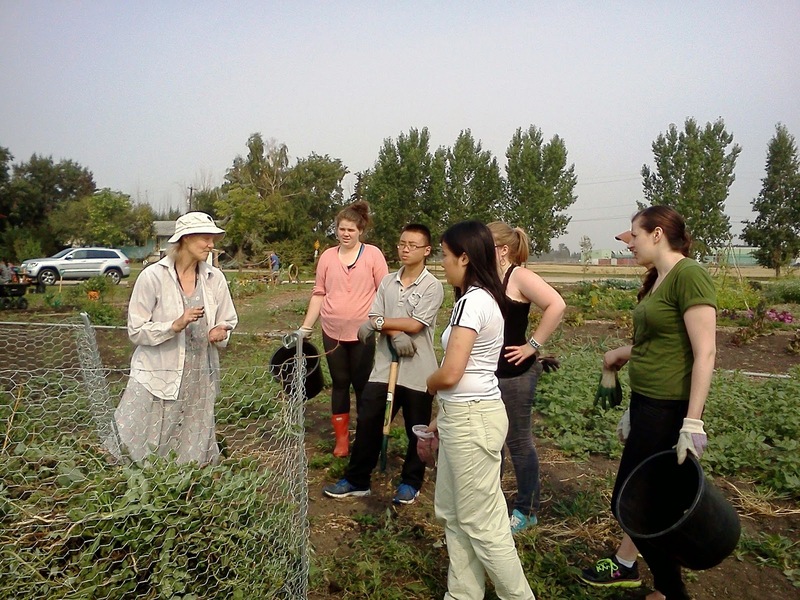 Volunteers have different reasons for joining Prairie Urban Farm. We wanted to share some of the ideas that were given by the orientation volunteers. Why do you want to volunteer with Prairie Urban Farm? "So I can get outside to learn"
"To meet the cool cat on the farm"
"Learn how to grow food myself and the benefits of having access to natural local grown produce"
"To feel more connected to nature"
"To do some gardening but not have to do it all on our own"
"Share in harvest of healthy produce"
How can we get the community involved with Prairie Urban Farm? "Have a harvest celebration or event"
"Posters at the schools/neighbourhood cafes"
"Host workshops - starting seeds, building bee houses, jam-making, pickling, cooking fresh foods"
"Workshops on how to make tea, soap scents, spice mixes"
"Workshops on how to freeze/prep/dry veggies for storage"
Kids from E4C's ArtStart programming painting a bench for Prairie Urban Farm. How can we involve kids, youth, post-secondary students & the elderly? "Host summer camp day trips"
"Putting some kind of 'fun' in all those gardening activities"
"Give presentations at schools and senior living complexes, then have certain days and times when elders and children/youth can garden together"
"Encourage the farm cats to hang around - kids love cats!" "Garden tasting night - like Taste of Edmonton"
"Live music at the garden"
"Compost that my neighbours will like"
"A little bit of everything. The best will be the A - Z in gardening, planting and taking care of fruit trees and shrubs"
"The different needs and growing times of different plants"
"Growing produce so my friends will want me on their zombie apocalypse team"
"Compost and how to grow herbs"
"Using native grasses to rehabilitate marginal soil and as a source of reducing carbon"
Garden Leader Iris teaching our student volunteers about the benefits of garden composting. - Mulching with newspaper, grass, straw and cover crops. - Raise rainwater tanks with cement blocks and add hose adapter onto barrels. - Trap snow melt with barrels or dugouts. - Swales for passive water management. Thank you to everyone who came out to the orientation and to our Garden Leaders for facilitating group discussions. Also, thank you to SustainSU for the reusable dishes that made our event more sustainable! Tree trimming and tree pruning services are the cornerstone to any successful tree care program. It is critical to sustaining your tree’s health, stimulating growth and retaining its natural appearance. If you try to trim your trees yourself, you could end up trimming incorrectly, causing serious damage to your beloved asset.